People line up for their early vote for the upcoming Thai election at a polling station in Bangkok, Thailand, March 17, 2019. Thailand's military chief, Prayut Chan-o-cha, is applying all resources to ensure his prime minister position remains unchallenged Sunday, when the first poll since 2011 is held here. Prayut says if he wins, voters would be returning his junta-led country to a "democracy." Prayut's biggest threat remains the exiled Shinawatra family and whether he can develop enough cross-party support to give his leadership the impression of legitimacy. As the U.S.-based Council on Foreign Relations recently noted, "The kingdom looks unlikely to resolve its political tensions, no matter the result of the vote. "Instead, Thailand seems destined for continued political instability, although that instability could come in different forms, depending on the results of the election." About 52 million Thais will cast ballots for the 500-seat House of Representatives. There will be 350 members elected directly, and 150 seats will be awarded based on a party's popularity. Members in the 250-seat Senate will be appointed entirely by the armed forces. "It will be very difficult because the constitution has already helped Prayut to remain in power by giving power to the senators to vote for prime minister after the election. So who decides?" Titipol said. "Not just the house of parliament but the senators will also have some say in this election of prime minister," he added. Almost 80 parties will field more than 2,700 candidates. The Phalang Pracharat Party also has the option of forging a coalition with the Ruam Palang Prachachat Thai Party and the People's Reform Party. The Thai constitution gives expats the right to vote in the country's elections. This year, "around 120,000 Thais around the world have registered to cast their votes," Thani Thongpakdi, Deputy Permanent Secretary of the Ministry of Foreign Affairs, told VOA. He said about 15,000 Thais will be voting by mail-in ballots in the Unites States. Prayut's biggest challenge will stem from the Shinawatra-backed Pheu Thai Party, popular in the rural heartland, and Future Forward Party, led by young entrepreneur Thanathorn Juangroongruangkit, who is hoping to win the youth vote. "When we talk about the seven-, eight million new voters, they would actually mean a lot to the future of democracy if they vote. But that doesn't mean all their votes would actually go to the Future Forward Party; some of them grew up with families when Pheu Thai was in power," he said. Yingluck's brother, Thaksin, was pushed from leadership by the military eight years earlier. Analysts said Pheu Thai and its allies can only be expected to win up to 160 seats, gaining a further 70 through alliances. That's not enough to form a government. The Democrat Party, however, remains in the mix and its leader and former prime minister, Abhisit Vejjajiva, says he will not support Prayut's return. For the anti-military parties — including Pheu Thai, the Democrats and Future Forward — to defeat Prayut, they must win a combined majority. 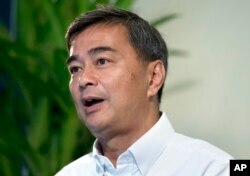 The leader of Thailand's Democrat Party Abhisit Vejjajiva talks to The Associated Press during an interview Wednesday, March 20, 2019, in Bangkok, Thailand. Observers say that is unlikely and that it would be almost impossible to find common ground to form a grand coalition, noting Thaksin and the Democrats are natural enemies and Future Forward is offering an alternative from the color-coded — red shirt, yellow shirt — politics of the past. "The key to understanding this election is that the voting is going to be more emotional than rational. Why should that not be, after all we've seen [U.S. President Donald] Trump and Brexit and [French President Emmanual] Macron. They're essentially very emotional results of elections, so why should that not happen here?" he questioned. The National Election Commission cleared Prayut of being a "state official," which would have barred him from competing. It also cleared Future Forward's Thanathorn of allegations he posted misleading information online.